Mom Photo Frame (Height 10 X Width 12 Inch) is the Best Gift for your Loved Mom. She Will be So happy with this Wonderful Gift. 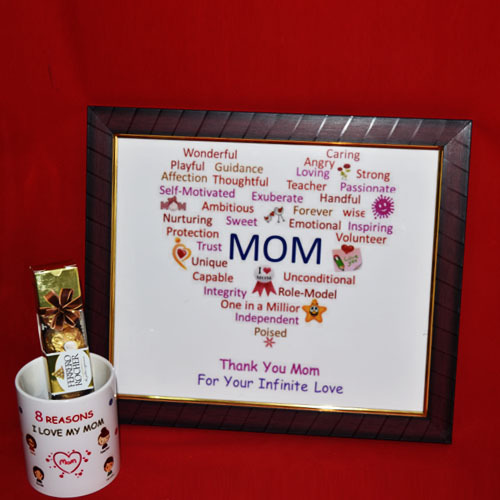 Mother is a great gift given by god wishing her on mothers with Mom Photo Frame is a fabulous idea.Wish her thank you once in a year and make her feel happy. A Mother is she who can take the place of all others, but whose place no one else can take.Send this Mug to your mother on any occasion and convey what your mom is. Get this 8 Reasons I love my mom mug Through online and make your mother feel happy and surprise. This Frame is Available Only in Vijayawada. Place an order 1 day in advance.